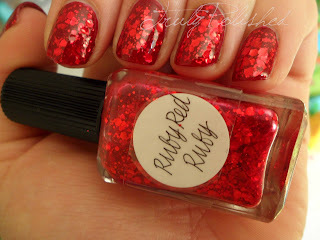 Truly Polished: Nail Mail and something VERY special! 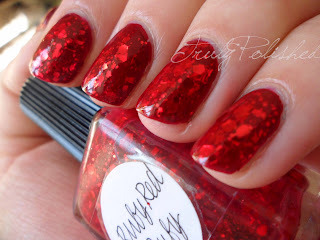 Nail Mail and something VERY special! I got home last night to find some very exciting nail mail! It was from Jessie, a polish buddy I did a swap with for a couple of bottles of Max Factor Fantasty Fire. I had the package in my hand before I'd even put my bag down because I knew what was waiting for me inside! Today is the day I get to utter words I never thought I would! I have a Lynnderella polish to show you!!!!!! If you don't know what this means then you must have been hiding under a rock for quite a while, and if you do know what this means then you'll understand how excited I am! Lynnderella is probably (ok, definitely) the most sought after cult brand of nail polish at the moment. It's exclusively available through Llarowe, but the buying process is a battlefield to say the least. When Leah Ann at Llarowe is open for wish lists you submit your list and then all the lists are worked through systematically by letter until they're fulfilled, then the wish list system starts all over again. I caught this at a difficult time so I'm waiting to submit my wish list which I think will be a pretty long one! 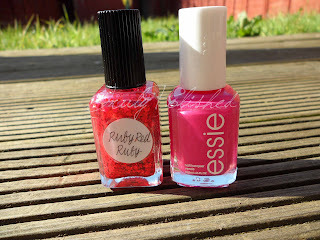 The Lynnderella that Jessie sent me was Ruby Red Ruby and I can't believe I was fortunate enough to get this in a swap! Jessie also sent me Essie Tour de Finance which I can't wait to try out! Make sure you click "Read More" to see my review and lots of pretty pictures! 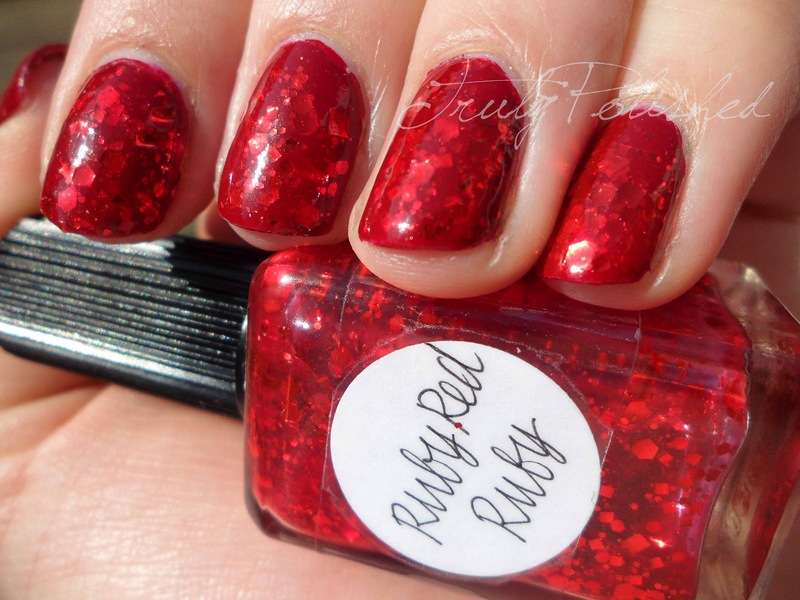 Ruby Red Ruby has red metallic hex and square glitter with smaller pieces of round glitter in a sheer red base. It wasn't originally on my top Lynnderella list because reds aren't usually my thing, but when Jessie offered me it, I saw some swatches and decided I had to have it! It really complements my skin tone, as red usually does, but I normally gravitate towards greens and reds so I only have ONE red in my stash, Rapid Ruby by Rimmel, which is what I layered the Lynnderella over. The formula of this was thick but easy to work with. 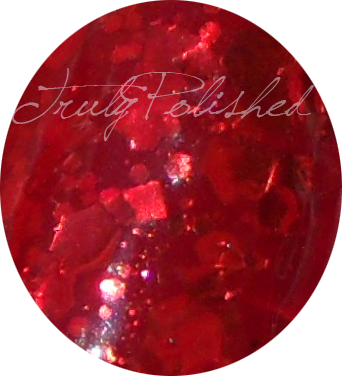 You want such a chunky glitter to be in a thick base otherwise you can't get the glitter to stay on the brush! You might have to go over your nail after the first coat to fill in some gaps or move the glitter to where you want, but all in all the application was easy! 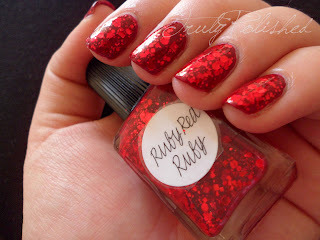 I used one thick coat of Ruby Red Ruby over Rapid Ruby for the photos below. Name-wise it's a match made in heaven and I think colour-wise it is too! Sorry my nails are so short and stumpy, I cut them before I flew yesterday because I can't stand having long nails to travel. It took a bit of getting used to but it's so much easier to type on my phone!!! A macro shot to finish it off! I still can't quite believe I have a Lynnderella! I love how this looks over red, the glitter gives a manicure some added depth, it's so pretty! I'd love to layer this over more colours but I'm not sure how it would work yet because of the base being red, I'll post pictures when I try some other combinations! If you'd like to try your lucky getting one of these polishes, you can subscribe to the mailing list at Llarowe to find out when they are accepting wish lists again. Im getting nervous! I sent another package to the UK last week & she received it already. I sent yours weeks ago. If you don't receive it by the end of the week, I will replace it. I won't be able to rest until it arrives. 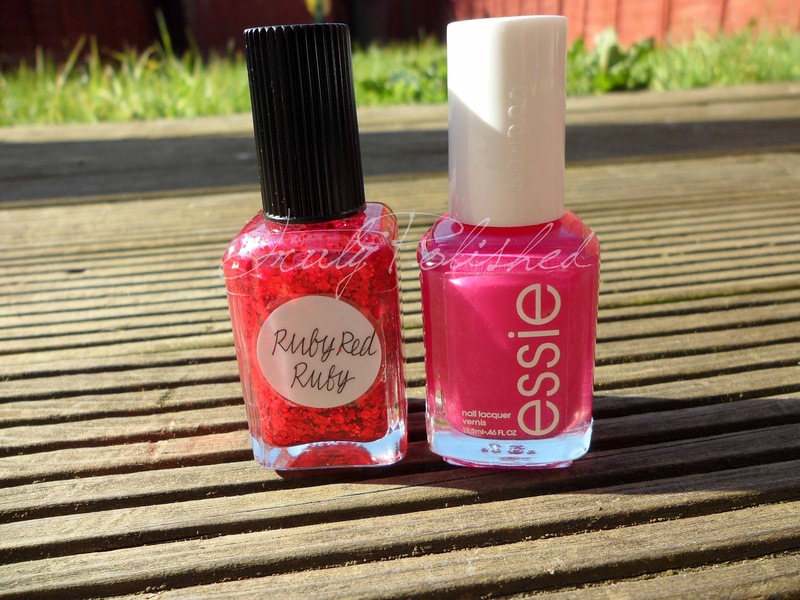 I just tweeted you, I got back from the sorting office about 10 minutes ago where the polish was waiting for me! It arrived on the 24th but I went abroad on the 22nd so missed the delivery! Sooooo pleased, can't wait to try them all out, but my beautiful Lynnderella is staying on until tomorrow! I have a perfect layering combo in mind for Absolutely Shore! Thank you so much! Yayyyyyyyy! Thank God! I was about to have a heart attack! I'm so relieved. I've never heard of this Lynnderella polish. I'm so new. What's the hype around it? Haha I'm so glad that the customs seems to be okay! You mean you've never heard of the brand? It's a range of all chunky glitters, all handmade by one lady, they're IMPOSSIBLE to get hold of. Well, almost impossible, but the whole system really takes ages, I've been waiting months to submit my wish list!